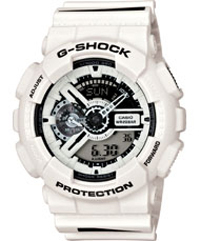 British wave of brand maharishi design has always been around camouflage, this summer, and CASIO G-SHOCK cooperation, the introduction of Joint watches models GA-110MH-1, black and white striped camouflage Bamdazzle trapped inside all the fans. The designer is also the maharishi main reason Hardy Blechman said that the inspiration of the design of the watch is from the First World War, in order to confuse the sight of the German battleship, the invention of this stripe camouflage with psychedelic magic. GA-110MH-1 is expected this Saturday (July 14) at CASIO meter concept store of goods and friendly pop shops to limit the sale, the friends you want to start with a good ready to prepare.